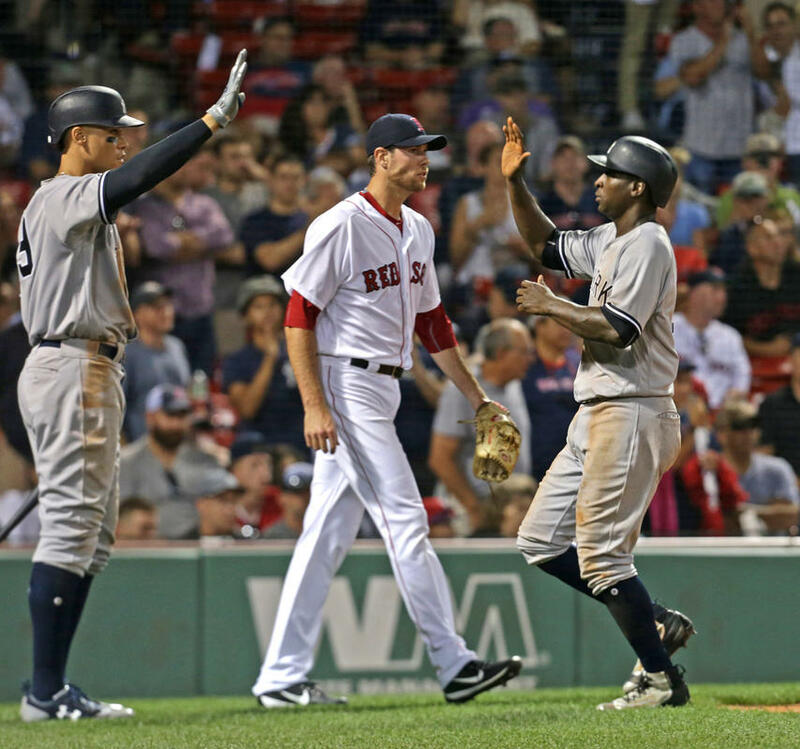 What started out as a nice afternoon game in Boston turned out to be an extended night game as the Yankees outlasted the Red Sox. Chris Sale, with a career ERA of 1.17 against the Yankees, was outstanding on Saturday which generally does not bode well for our guys. Fortunately, Luis Severino was up to the task and kept the Yankees in the game, setting the stage for late inning heroics. The Red Sox scored the first run in the 3rd inning. With one out, Mookie Betts and Dustin Pedroia both walked to put runners at first and second. Xander Bogaerts hit an infield roller to third that Chase Headley scooped up, looked to first and then turned around and threw too late to shortstop Ronald Torreyes, covering at third. Everyone was safe. Mitch Moreland then lofted a deep fly to left and Betts easily ran home for the game’s first run. 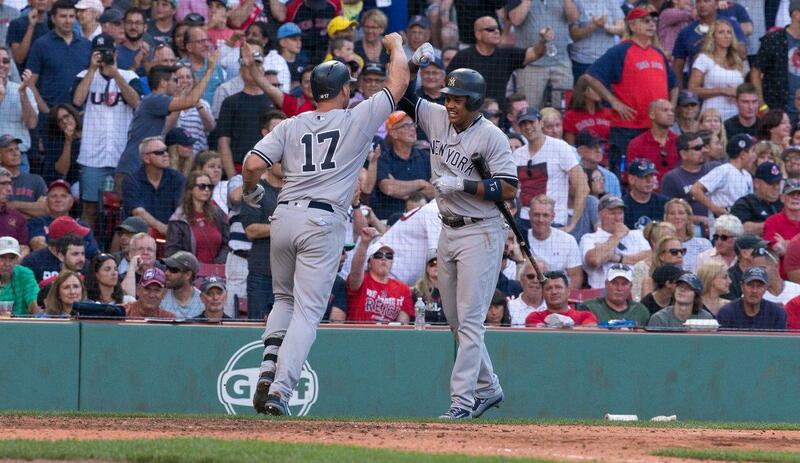 Hanley Ramirez could have done more damage but Severino got him on a line out to Chase Headley to end the threat. The Yankees only managed three hits off Chris Sale, which included two doubles, but they were unable to push any runs across the plate. Sale went into the 8th inning, getting Ronald Torreyes to ground out before Brett Gardner singled to right. Sale then got Gary Sanchez to go down swinging, but with 118 pitches thrown (and 13 strikeouts), the Sox made the call to closer Craig Kimbrel. Aaron Judge flied out to right to end the top half of the inning. In the bottom of the 8th, the Yankees brought in Tyler Clippard (Yikes!) to replace Luis Severino. Tzu-Wei Lin promptly singled to center and I had a sinking feeling of “here we go again”. It didn’t help when the count rose to 3-0 on the next batter, Mookie Betts, but on a full count, Betts popped out to short. Lin then got a great jump on a steal attempt and was sliding past second baseman Starlin Castro who stayed with the play and took the throw from Gary Sanchez to catch Lin on the foot before his hands reached second base. The Red Sox challenged the play but the call on the field was upheld (rightfully so). So good to have Castro back at second. Dustin Pedroia lined out and Clippard was able to leave the field with his head held high. 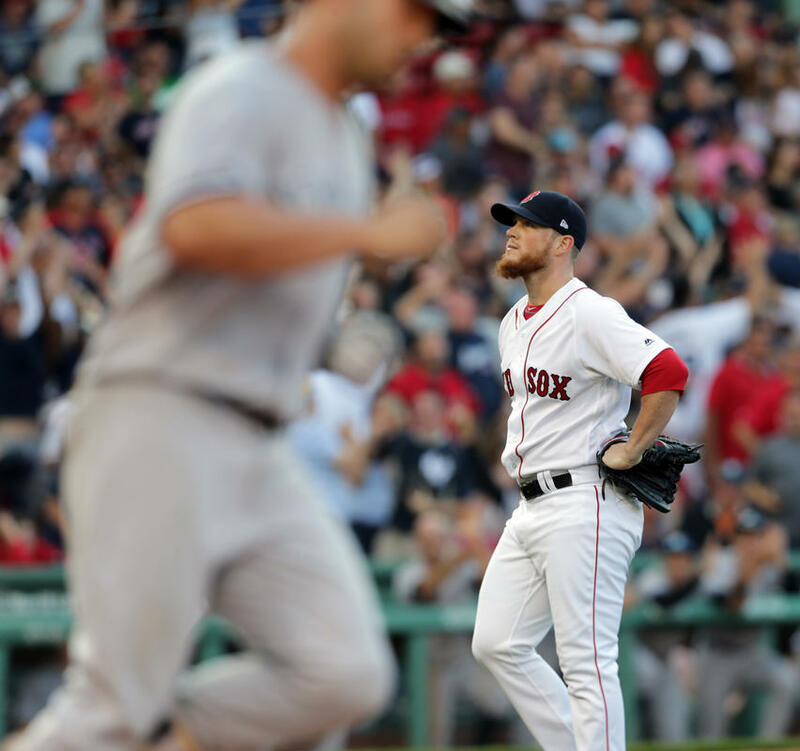 For his Red Sox career, Craig Kimbrel was 30-for-30 in save opportunities as he took the mound in the 9th. A good point was made during the FOX TV telecast by A.J. Pierzynski with the four-out save attempt. Aaron Judge, despite the fly out to end the top of the 8th, extended the at-bat which forced Kimbrel to throw 10 pitches. It’s not often that he throws that many pitches before having to sit and come back out again. It would be a foretelling comment as Matt Holliday greeted Kimbrel with a game-tying, save-blowing home run to left center over the Green Monster to open the inning. Starlin Castro subsequently reached base when first baseman Mitch Moreland was pulled off the base on an errant throw from Xander Bogaerts and pinch-runner Jacoby Ellsbury stole second, just beating the tag by Bogaerts. But Ellsbury was left stranded when Kimbrel proceeded to strike out the side. The bottom of the 9th brought in Dellin Betances who seems to have left his control problems behind him. He easily retired the three batters he faced and the game headed into extra innings. The Red Sox looked like they were in position for the walk-off win in the bottom of the 10th. Chasen Shreve had been brought in to replace Betances, and he gave up singles to Andrew Benintendi and Jackie Bradley, Jr to put a runner in scoring position with no outs. It was a little surprising that Benintendi didn’t try to run for third on JBJ’s hit, but thankfully he did not. Girardi wasted no time in giving Shreve the hook and brought in Adam Warren. Warren, proving how much he means to this team, retired the three batters he faced, leaving Benintendi stranded at second. Had Benintendi been on third, he most likely would have scored the winning run when Tzu-Wei Lin flied out to Aaron Judge for the second out against Warren. The 11th inning brought an unusual play that resulted in a game protest by Red Sox manager John Farrell. Matt Holliday walked to open the inning. Jacoby Ellsbury then hit a grounder to first, and Mitch Moreland threw the ball to Xander Bogaerts for the force out at second. But Matt Holliday, as we later found out, mistakenly thought that Moreland had stepped on first to retire Ellsbury (he had not) and turned to dive back toward first base. Bogaerts threw the ball back to Moreland but it glanced off Ellsbury’s leg since Holliday was in Moreland’s way, leaving Ellsbury safe at first. 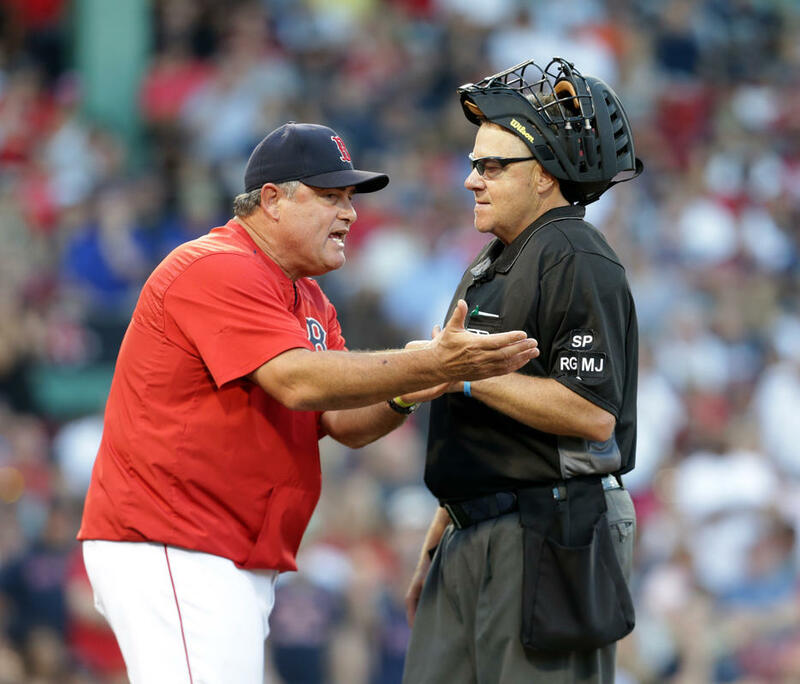 Farrell argued unsuccessfully that it should have been called a double play due to interference. Despite the 4 minute, 50 second delay, it didn’t really matter as neither Chase Headley nor Didi Gregorius were able to advance Ellsbury from first. From there it was a battle of the bullpens until the top of the 16th inning with Boston’s Doug Fister pitching. Jacoby Ellsbury doubled to left and Chase Headley singled to center to put runners at the corners with no outs. 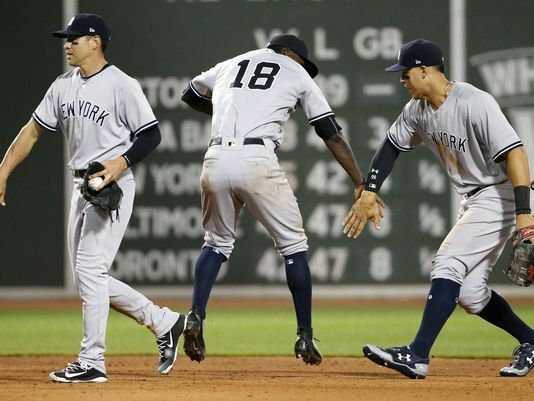 Didi Gregorius singled to center which scored Ellsbury with the go-ahead run. Austin Romine followed with a single to center, scoring Headley while Gregorius took second. Ronald Torreyes successfully laid down a sacrifice bunt to move the runners to second and third. Gary Sanchez hit a sac fly to left, scoring Gregorius with an insurance run as the Yankees took a 4-1 lead. Ben Heller (1-0), who had replaced Aroldis Chapman in the 15th inning, retired Dustin Pedroia, Xander Bogaerts, and Mitch Moreland to win the game for the Yankees. It was a very long game (5 hours and 50 minutes) but perseverance paid off as the Yankees eventually pulled out the win. I can’t say enough about the tremendous performance by Luis Severino. It was the key to the game, along with the dramatic home run by Matt Holliday in the 9th which gave Craig Kimbrel his first blown save at Fenway Park in a Red Sox uniform. Considering today’s double-header, it is amazing to think the Yankees will have played at least 34 innings in 24 hours by the end of the day. The Yankees (46-42) remain in third place in the AL East standings but moved 3 1/2 games behind the Red Sox. The Tampa Bay Rays beat the Los Angeles Angels again, 6-3, to move 2 1/2 games behind Boston. New Yankees first baseman Garrett Cooper had another unsuccessful day at the plate before he was lifted from the game. He was 0-for-3, with two strikeouts. Aaron Judge may have been 0-for-6 but I’d still go back to his extended at-bat against Craig Kimbrel in the bottom of the 8th as a key factor for Holliday’s 9th inning home run. A long hard day but it’s so much better to walk off the field with a win. Michael Pineda will meet with Dr Timothy Kremchek, an orthopaedic surgeon, in Cincinnati, Ohio on Monday for a second opinion. Dr Kremchek is the medical director for the Cincinnati Reds. If Tommy John surgery is needed (as expected), the procedure could be performed as early as Tuesday. 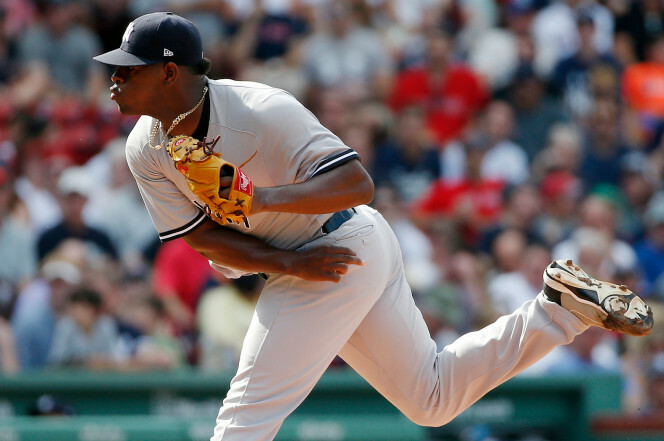 CC Sabathia will start Game 1 of today’s double-header in place of Bryan Mitchell. In a flurry of roster moves today, the Yankees recalled RHP Domingo German and added LHP Caleb Smith to the 25-man roster. Relievers Ben Heller and Jonathan Holder, both of whom would have been unavailable today after yesterday’s game, were optioned to Triple A. Michael Pineda was moved to the 60-day DL with his right UCL injury and RHP Bryan Mitchell was added as the “26th man”. Prior to yesterday’s game, the Yankees activated Starlin Castro and optioned Tyler Wade to Scranton/Wilkes-Barre. I am not sure why it took so long but Manager Joe Girardi has finally said that Tyler Clippard is no longer the “7th inning” guy. Adam Warren and Chad Green will take over the duties of setting up Dellin Betances and Aroldis Chapman. Good move. Warren and Green have both been outstanding in recent weeks while the bullpen overall as struggled. Chance Adams had his latest start for the RailRiders yesterday. While he did limit the Buffalo Bisons to two hits and one run in 4 2/3 innings, he walked four batters. It is the command issues that are holding Adams back at this point (along with the development of his third pitch) so yesterday was not a positive outcome. Adams did not factor into the decision as the RailRiders defeated the Bisons, 2-1. Miguel Andujar was the hitting star. He was 2-for-3 and provided the eventual margin of victory with a run-scoring single in the 7th inning. Have a great Sunday! In honor of the double-header, let’s have twice the fun! Let’s Go Yankees!